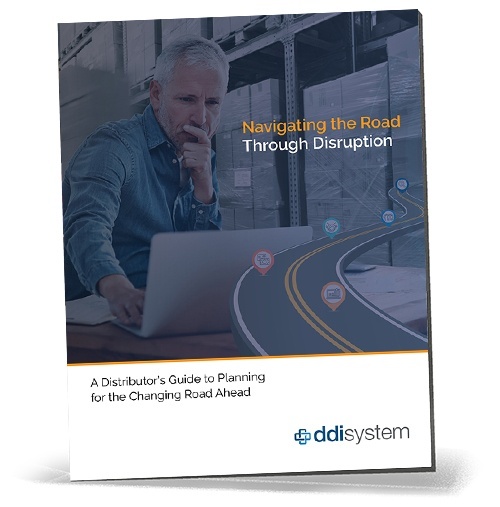 DDI System helps distributors navigate disruption and prepare for the unpredictable road ahead. Understand 5 critical strategies distributors must employ to combat disruption and win against the competition. Improving inventory control and warehouse management coupled with superior accounting and financial reporting is critical to achieving greater efficiencies. Embrace an end-to-end solution to optimize distribution operations and drive profitability. Use the same information from your ERP software to present a polished digital catalog with advanced search functionality, real-time stock and pricing, order status and a robust customer service portal. Your customer relationships are continuously being tested. Ensuring availability through your website, on a mobile device and with up-tothe- minute information from your sales teams incites customer loyalty to remain competitive. High-performing employees rely on knowledge and information to improve the customer experience. Integrated CRM ensures employees uncover upsell opportunities and product/ service recommendations for each customer. Built-in real-time dashboards automatically turn everyday information into useful decision-driving knowledge. Capitalize on DDI’s distribution industry expertise and gain immediate actionable business insights. Now, more than ever, distributors require an ERP that can combat disruption and drive customer acquisition and retention. Inform ERP helps distributors navigate a path forward with powerful analytics, embedded CRM, on-the-go mobility and connected eCommerce that unites teams for unprecedented success. Hear how leveraging Inform's buying group integration technology helped Amerisource unite their team and double in size in eighteen months. Plus, learn how Inform aided in making the acquisition of six companies possible with the help of a robust CRM and accurate data sharing. 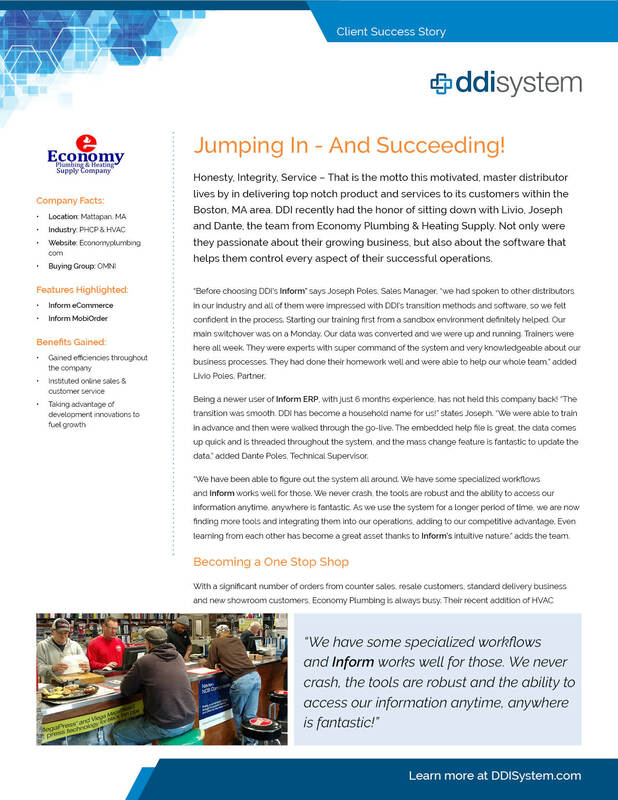 Boston based Economy Plumbing experiences a significant number of orders from counter sales, resale customers, standard delivery business and showroom traffic. When it came time to add HVAC products to their inventory and expand the warehouse, they turned to DDI System. Johnstone Supply relies on the strength of industry-specific knowledge and in-depth training to remain a distributor of choice for HVAC customers. Hear how rich analytics, unparalleled support, and daily calendaring helps Johnstone continuously exceed customer expectations. Distributors are facing enormous pressures to embrace technology and garner tremendous success. 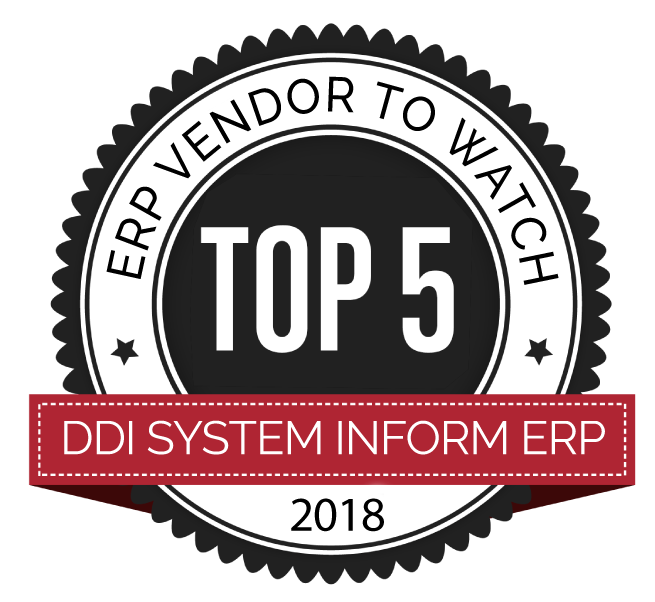 In this study, DDI System discusses 5 areas of disruption and provides practical solutions for navigating the road ahead through the power of a completely connected ERP. This guide will provide you with practical solutions to navigate your path forward. DDI System LLC © 2017.